Our compressors bring you outstanding performance, flexible operation and the highest productivity, while minimizing the total cost of ownership. Built to perform even in the harshest environments, our products keep your production running smoothly. Offering best-in-class performance and total reliability, our products answer your advanced needs. The lowest power consumption and noise emission in the industry. The requirement of compressed air fluctuates violently in different time every day, different weeks, or different months every year. 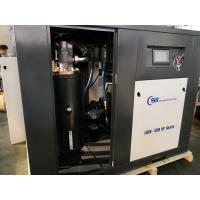 The range of fluctuation is 40% to 80%, Rotorcomp adjustable-speed drive screw compressor can meet the user’s requirement exactly. With frequency conversion soft start reduce in-rush starting current, reduce wear on electrical switch gears and motor windings. Also maintain less power during starting and stopping of motors and increase protection to motors. Also reduce peak demand and improve power factor. 3. Frequency Inverters (ABB&SIEMENS customized).